"The sentiment of the song came first. I wanted to write something that was honest and heartfelt." Liam O'Donnell wrote If It Wasn't For You for his late mother. Somewhere, she's smiling. For the past few weeks, TV viewers across the US have been stopped in their tracks by 30 seconds of a song they never heard before - or perhaps it's one they think they've heard at some point in their lives. Such is the power of If It wasn't For You, an infectious, retro-sounding pop gem that mixes echoey, rockabilly guitar licks with an arrangement torn from the blue-eyed soul playbook. 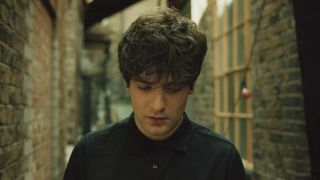 The song is the centerpiece of a holiday commercial for Zales jewelers, and the exposure is building a serious buzz for the band Various Cruelties, a London-based four-piece comprised of Liam O'Donnell (vocals, guitar), Beanie Bhebhe (guitar), Adam Coney (bass) and Dean Valentine Smith (drums). The group received good notices when they released their self-titled debut album late last year, but now, with the unbeatable marketing power of TV, they're poised to break big. MusicRadar hooked up recently with O'Donnell to talk about the writing of the track, how it got picked for such prominent placement and whether he feels funny about finding success through an ad aimed at Christmas buyers. Could you describe the writing of If It Wasn't For You? Did the chorus come first or the verse? "I think the sentiment of the song came first. I wanted to write something that was honest and heartfelt. I was listening to loads of Dylan at the time. The verses emerged first, and then the chorus just appeared as if from thin air. The last bit was the balancing of If It Wasn't For You at both the start and end of the chorus. I wrote all of it in a couple of hours. I still think the song feels quite spontaneous. Maybe that's because it appeared quickly." What kind of demo did you make? Were all of the elements there, or did things change a bit in the studio? "Good question. There was an original demo of the song on piano, and it had a different middle eight. The version you are familiar with was recorded in the Isle of Wight. We just got a groove going in the studio, and I sang the song over the top. The original middle eight got chucked and the chords changed a little, too. It was the first thing I recorded as Various Cruelties." The song has a strong blue-eyed soul vibe, but there's rockabilly in the guitar hook and solo. Are these both influences for you and the group? "I believe I was thinking about the Flamingos' I Only Have Eyes For You. I've been obsessed with that song ever since I heard it in the movie A Bronx Tale. It's probably been in loads of things, but that was the first time I'd heard it. So, yes, definitely a blue-eyed soul vibe. I'm a massive Amy Winehouse fan, and I've already mentioned Dylan. We're also big fans of bands like the Black Keys, Jesus And Mary Chain and Primal Scream." That's a mellotron underneath the guitar solo, right? How did that come about? "Yes, I'd love to say it was an inspired choice, but it was purely chance. There just happened to be one in the studio. We thought it sounded great on there." When you wrote or recorded the track, did it feel like a winner, or have you been surprised by the response it's received? "I think the track is possibly one of the most honest things I've ever written. I guess people can relate to the honesty, and maybe that's why it's been well received. The song is actually written about my mother. I didn't do it to be mushy or to get compliments. But she ain't around anymore, and rather than moan about my life like people on X-Factor seem to do every week, I thought I'd create a positive antidote to her. So, yes, the track felt good for that reason." Various Cruelties are (left to right) O'Donnell, Dean Valentine Smith, Adam Coney and Beanie Bhebhe. How exactly did the song come to be featured in the Zales TV spot? Were you gung-ho on the decision, or did you have any trepidation? "I don't really know how it came about, to be honest. I was told we were in the mix for it but didn't want to get my hopes up too much. I am extremely excited about the Zales ad as it gives us a fantastic opportunity to have our music featured across USA and Canada. I'm delighted about it, to be honest. A no-brainer, really - although people keep asking me if I got any free jewelry out of it. I'm not really the type for bling." Does it feel strange to be attracting such attention for one of your songs via a jewelry commercial, or do you see it as just another way bands break through? "No, I think in this day and age, it's just another way that can help bands break through. I want people to hear our music. Music is everywhere, and people can listen to whatever they want whenever they want so easily. They might never have come across Various Cruelties otherwise. Plus, I think the commercial is great." What's next for the band? Might you be touring the US soon? "I'm sure we would all love to come and play in the US as soon as possible. We were fortunate enough to record our album in Los Angeles. Besides making a record, we had a great time hanging out, meeting people and experiencing what LA had to offer. I would be very excited to see the rest of the country."